Luis Suárez has continued his extraordinary scoring run in La Liga with two of the six goals at Alavés. He’s top scorer in the competition on 18 goals, with Leo Messi hot on his heels with 17 after also getting on the scoresheet yesterday. It was the Argentinian’s first ever goal at Mendizorrotza. He has now scored at an all-time record of 35 different Liga stadia, two more than Raúl González (33). Suárez’s brace also ties him in 13th place on the all-time Barça goalscoring chart with his current boss Luis Enrique. Albeit a striker rather than attacking midfielder, the Uruguayan has reached the milestone in just 128 games, while the Asturian needed 300 over eight seasons. 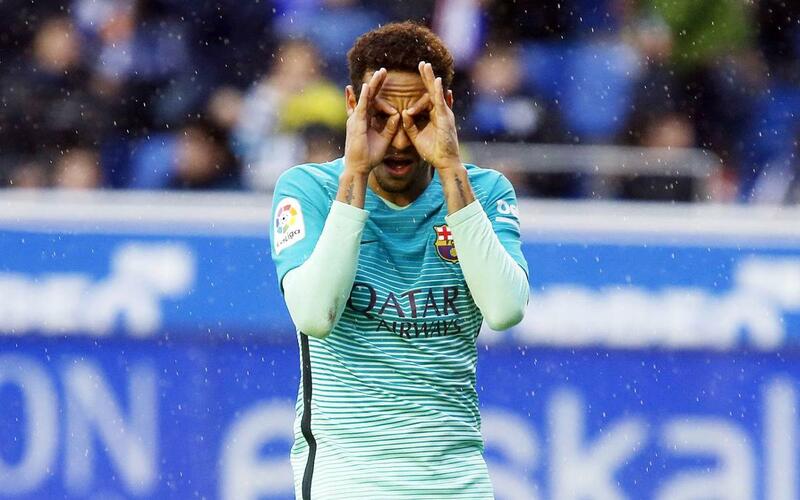 Neymar Jr also found the target at Mendizorrotza. The Brazilian has six league goals so far, and oddly enough all of those were scored away from home. He also hit the net at Leganés, Sporting Gijón (2), Celta, and Eibar. Curiously, the Brazilian’s last four goals in all competitions have all been against Basque clubs. His euskera victims have Athletic Club, Real Sociedad, Eibar and now Alavés. Aleix Vidal will be out for an estimated five months after suffering a nasty ankle injury. In his last eight games, the right back had scored two goals (against Las Palmas and Athletic Club) and made five assists (versus Borussia Mönchengladbach, Hercules, Eibar, Real Sociedad and Alavés). Barça totally dominated the ball against Alavés. They made twice the number of passes (682 compared to 288) of which 84% found their man as opposed to 76% for the home side. This was Barça’s tenth league clean sheet of the season. Overall, the Catalans now have 61 goals for and just 18 against. Sergio Busquets received his fifth yellow card of the league campaign on Saturday. That means he’ll have to sit out the next game at home to Leganés at Camp Nou on Sunday 19 at 8.45pm CET (TICKETS HERE) through suspension. Samuel Umtiti has won all twelve of his league starts for the club since joining in the summer.